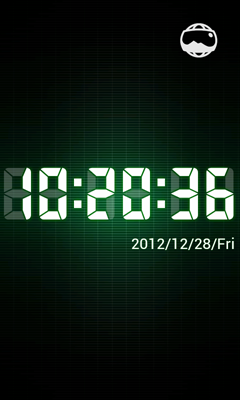 "tDigitalClock" is a full screen digital clock application. The digit sizes are auto adjusted to maximally fit the screen, so tDigitalClock is available with many environments such as Smart phones and Tablet terminals. You can set the camera photograph of the child or the photograph of the pet to a background image. It has both portrait and landscape modes support. 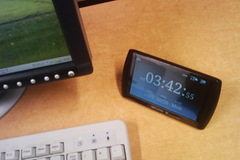 tDigitalClock bring you a comfortable time used as table clock with desk work and sleeping! Add a panoramic image display function. Fixed a bug that gallery does not appear in more than Android 4.1. Portrait view and landscape view are changed automatically. 12-hour/24-hour format is synchronized with android's date format setting. You can switch to select a "MENU"->"Switch Status Bar" or touch on the screen. * Some devices aren not supported. You can switch to select a "MENU"->"Switch Seconds". * Please hide the number of seconds, if you worry about the consumption of the battery. You can switch to select a "MENU"->"Background Image"
You can set image from your Photo Gallery. * landscape view and portrait view indication can set an image in individual treatment. You can switch to select a "MENU"->"Background Image"->"Gallery list"
You can set image from your Photo Gallery list. You can switch to select a "MENU"->"Font"
*It is oblong landscape view and portrait view indication common setting. 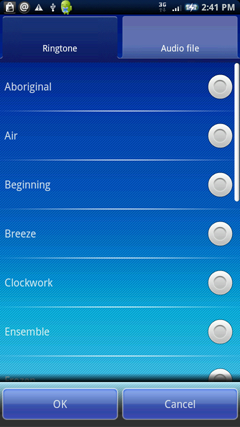 You can switch to select a "MENU"->"Alarm"
You can switch to select a "MENU"->"Setting"
You can customize a color,transparency and shadow of the font with this screen. For an example, you use it at the time of design changes such as the setting change of the background image. It display a preview screen when click a preview button. If confirmation is completed, you can return to a setting screen by a back button. * The clock font color is ORANGE, transparency is 80%, shadow is none. 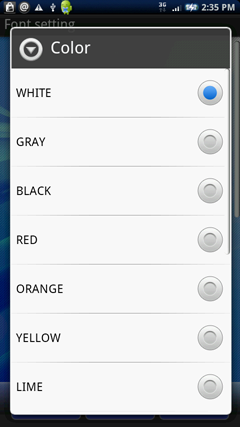 The font color can set the transparency from 0% to 100% from 13 colors. The shadow color can set from 13 color. When the kind of the panel chooses NONE with three kinds, it is non-displayed. The alarm starts when setting it to On by a present content. Time to sound the alarm is set. 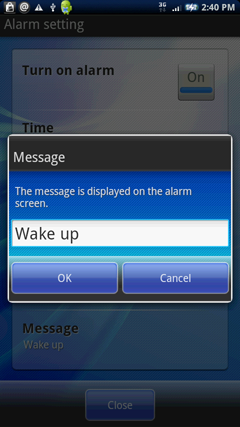 The alarm sound is set from the ring tone or the audio file. A day of the week when the alarm starts is set. The Snooze time is set. The message of the alarm is set. 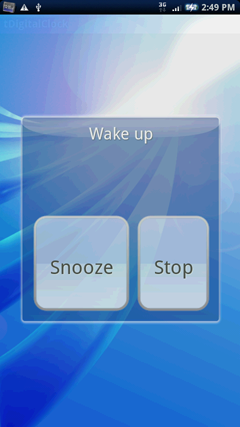 The alarm stops when the snooze button is clicked, and the alarm rings again after the set time of snooze. The alarm stops when the Stop button is clicked. The alarm keeps ringing even if returning to the home screen. The icon of tDigitalClock is clicked. 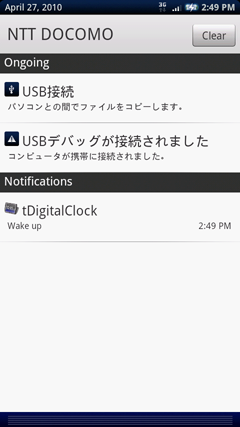 tDigitalClock is clicked from the list under the notification of the statusbar. 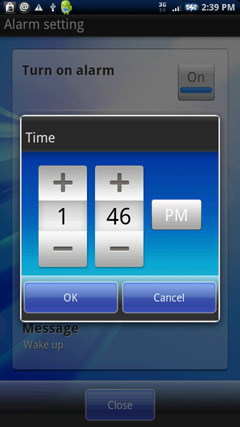 The clock screen can be set in "View". The bar displayed in the upper part of the screen is made non-display. The second hand of the clock display is made non-display. It can be set to start this application program by the "automatic startup setting" when charging device. It is a connector inserted directly from the power supply in the terminal. 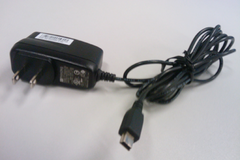 The connector connected directly to the power supply without converting it from the terminal USB is classified into here. It is a connector to use in cases to connect to a PC. You can select the plugged types. 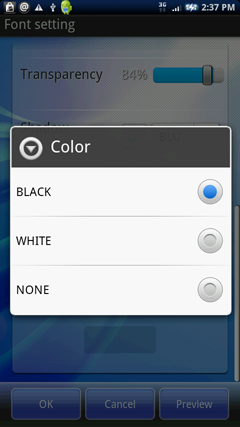 Only the SD card can be specified in a usual Android device. The Android device made by Sharp can retrieve SDcard, internal device either. You can choose the date format of six patterns. 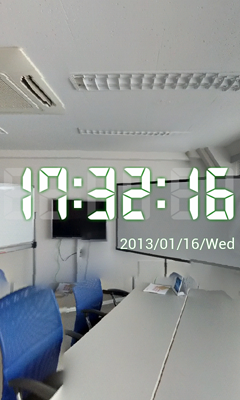 Display function is a function that can tDigitalClock panoramic view panoramic image as the background of the tDigitalClock that was created in (photographed panorama in all directions 360 degrees) camera features that have been added from Android 4.2. Panorama setting screen is displayed when you select "MENU"->"PANORAMA". Panoramic image is applied to the clock screen background and select "Load image from local file"->"panoramic image from gallery"
Move the display position by swiping up, down, left and right in the panorama window you will be able to zoom in and zoom out by pinching out, pinch operation. Download from Google Play "Applications -> LifeStyle"
The resolution of the background image is matched to the screen resolution of the terminal. The addition of the function that starts automatically when the terminal is charged. The addition of the function to add a shadow to a font. 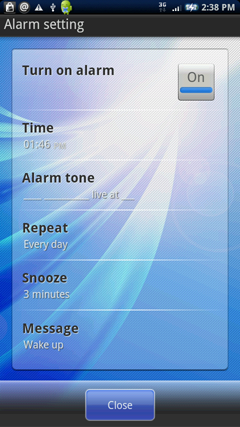 The addition of the alarm setting function. The addition of the gallery list function. The addition of the date format change function. The layout adjustment of the medium-resolution and high-resolution device.